It’s December and Christmas is just around the corner! It’s hard to believe, considering I have A) yet to whip out my Christmas music, which is very unlike me since I usually give in by mid-November, B) have yet to put up any Christmas decorations, and C) (and worst of all), I have yet to start my holiday baking. Someone please press the panic button for me. All that being said, I’ve been trying to be good and eat well from now until Christmas. November has been the month of gluttony for me, between my brother and parents visiting, and the week-long conference, where I just sat and ate and sat and ate some more. And so, after a couple of days of uninspiring lunches as I tried desperately to clear some of the junk that was in my fridge, I made a wonderful salad that’s healthy, delicious, easy to make, and beautiful to look at. I cooked some whole wheat couscous and tossed it together with some winter fruits that are currently in season (granted, not native to Canada)—persimmons and pomegranates—green onions, mint, parsley, lemon zest, and a lemon-honey-dijon vinaigrette. Serve at room temperature the same day, or better yet, leave it overnight for the couscous to soak up the dressing to give the salad a more intense flavour. Perfect for holiday potlucks, and I promise you, people will be wowed by how gorgeous it looks with all the beautiful colours! Put chicken stock into a small pan with a tight fitting lid over high heat; add 2 teaspoons olive oil. When stock comes to a boil, remove pan from heat, stir in couscous, cover pan and let sit 5 minutes. Remove lid and fluff couscous with a fork. Set aside to cool. While couscous cooks and cools, prep the other ingredients. 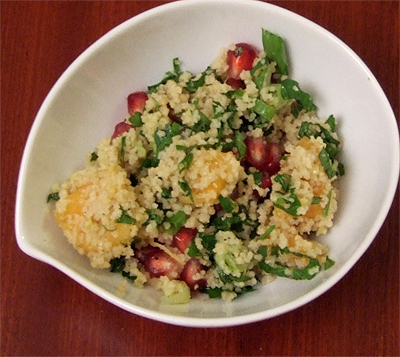 Combine the diced persimmon, pomegranate seeds, sliced green onions, and chopped herbs in a large bowl. 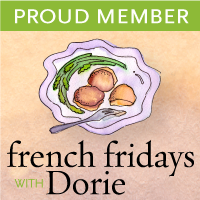 In a separate bowl, whisk together 2 tablespoons olive oil, lemon juice, lemon zest, and pinch of ground cumin. Pour the dressing over the cooled couscous and stir to combine. Season with salt and pepper. 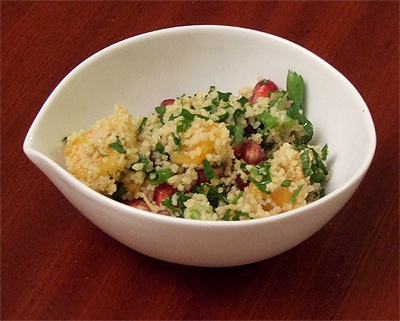 Add couscous to the persimmon-pomegranate mixture in bowl and gently toss to combine. Sprinkle over with toasted almonds and serve at room temperature or cold. Posted by Bonita at 8:58 p.m.